About Ringo Hill Farms Equipment Company! 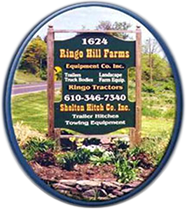 Ringo Hill Farms Equipment Company Inc. (Ringo Trailer) is a family owned and operated business located at 1624 Route 212 in Quakertown, Pennsylvania . We pride ourselves in quality products, excellent performance and expertise in customer service. Most of the products that we provide are designed and manufactured here on site, where the design and quality is most important to us. Ringo Hill specializes and focuses on commercial grade equipment including, but not limited to trailers, truck beds, landscape equipment, construction equipment, farm equipment, and towing products. Our inventory level of parts and accessories for our brand of equipment and competitive brands are exceeded by few!